Taken together, the Icelandic and Greek financial crises can be seen as the second stage of the larger global banking crisis. The first stage of the global banking crisis, which began in late 2007, was centered in the European and U.S. mortgage and mortgage derivative market. The second stage began with Iceland’s monetary and fiscal crisis in 2009 and continues with the current Greek crisis, and is centered in European sovereign debt. The global crisis banking crisis is a multi-phase global economic crisis caused by years of over-borrowing followed by the current deleveraging. This deleveraging was, of course, set in place by all those who gambled with their own and other people’s money. As time passes, more and more of these gamblers will be unmasked and there will be more countries, companies, industries, and individuals who will lose face and capital in coming months and years. We anticipate that these problems will continue as various sectors delever over the next six to eight years. A golden comet now lights up the sky; an omen of what is in store for our future. Gold is up just over 50% during the last 1-year period. Given the buying strength we are seeing lately, especially from central banks, we will likely see gold in the $1600 range quite soon. Of course, there will be road-bumps along the way; but the general course will take us to $1650 and then into the $3000-5000 range. Where Gold goes beyond there depends on the monitary policies of the United States and what kind of thinking takes hold as all of this inflation begins to hit hard where it hurts. The beautiful thing about gold, is the fact that it gives us all a clear omen, which allows the wise and observant among us, a chance to prepare for difficult times ahead. This golden comet will become ever more brilliant with the passage of time. Perhaps most of us will soon realize what is occurring and what they must do to deal with the situation. This situation isn’t going to go away on it’s own and nobody is going to solve the problems it creates for us in our stead. My point: Asset prices are embedded not only in our psyche, but the actual growth rate of our economy. If they don’t go up – economies don’t do well, and when they go down, the economy can be horrid. To some this might seem like a chicken and egg conundrum because they naturally move together… if long term profits match nominal GDP growth then theoretically stock prices should too. [L]et me introduce Chart 2 a PIMCO long-term (half-century) chart comparing the annual percentage growth rate of a much broader category of assets than stocks alone relative to nominal GDP. Let’s not just make this a stock market roast, let’s extend it to bonds, commercial real estate, and anything that has a price tag on it to see if those price stickers are justified by historical growth in the economy. The price of gold has cleared the former all-time high, reaching into the $1040 (USD) range for the first time in the history of the yellow metal. The chart below illustrates how gold formed and broke through a bullish inverted head & shoulders formation, broke through the top of a consolidation wedge, and broke through a wedge in the MACD indicator. 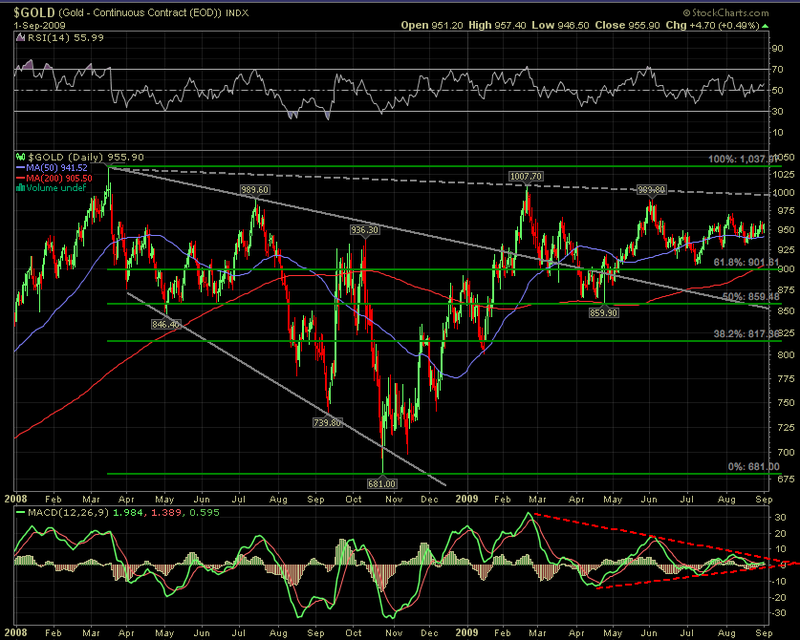 With an RSI reading of 70, gold is one hot commodity. This should start ringing some alarm bells at major money centers around the world. It is becoming ever-more apparent, that we are experiencing a serious rout of inflation which could very well turn into a devastating wave of hyper-inflation in due time. Bounded by the gray trend lines: an Expanding Corrective Wave which was broken to the up-side, the upper bound of this formation was then re-tested confirming the breakout. 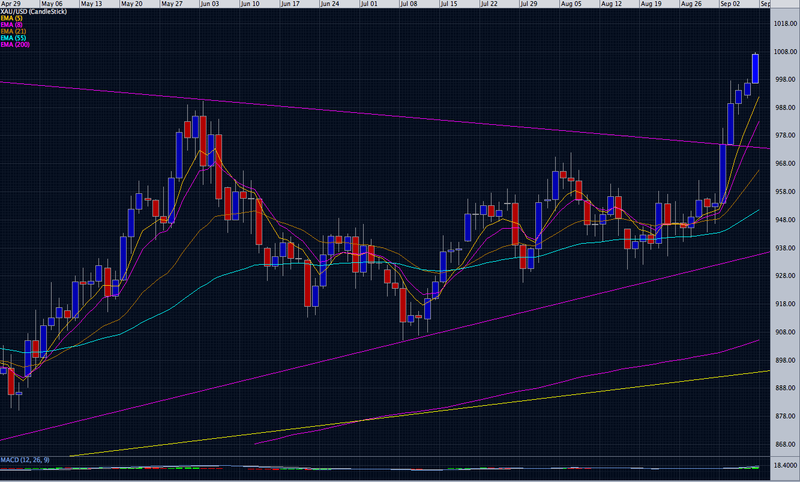 Bounded by the red trend lines: a Wedge formation which was broken to the upside last week. Denoted by the purple trend line: an Inverse Head & Shoulders formation with the current price hovering close to the neck-line. Denoted by the red trend lines in the MACD indicator (below): a Wedge formation which was broken to the up-side. Last week gold had a historic close. In fact it was the highest weekly close ever for gold; leaving it above the psychologically significant $1,000 mark after a weekly close for the first time in history. 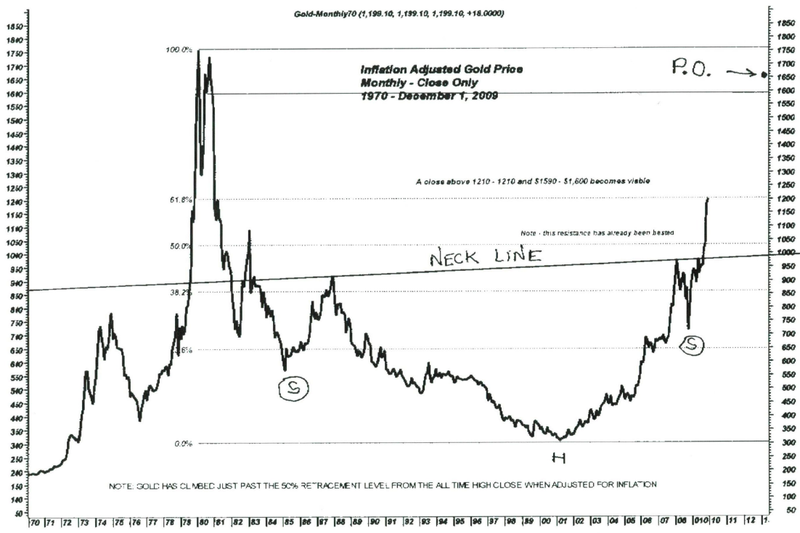 As of September 25, gold has broken through two long-term formations and sits at the neckline of an inverse head & shoulders formation. Given that gold closed the week at the neckline of such a long-term Head & Shoulders formation, after having shown such resilience over the past few weeks, it is time we prepare ourselves for a significant move, further into unknown territory. The chart above indicates that gold is acting like a coiled spring, ready for the slightest trigger, to send it into launch mode; bringing the price into the $1200-1300 USD range. I remember seeing the wedges, similar to the current chart, though less volatile than the current price fluctuations. I remember seeing a good-sized wedge in the MACD which had broken to the upside. In fact, it was at this time that Jim Sinclair, the CEO of Tanzanian Royalty Exploration and the author of Jim Sinclair’s Mine Set had a contest for gold community members to draw the relevant trend lines on an Investors Business Daily gold chart that he provided. The prize for this contest was a one ounce gold coin. Well, I took Jim up on his offer and drew formations similar to those on the attached chart. 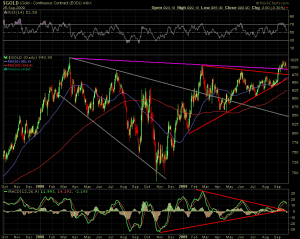 Including a MACD breakout precisely like the one on the current chart. I made the chart simple yet elegant and intuitive and fortunately for me; out of all of the hundreds of charts sent in to his fax, he chose mine as the winner. What a great feeling that was and what an appreciation I gained for the power that each of us has to understand what is going on in the economic world with elegant simplicity not endless complexity. It was even more rewarding to see gold advance to $450 by late 2004 and then $700 by 2006. What you have to realize, when you are studying these charts, is the fact that the underlying forces which propel gold skyward have not changed. The governments and central banks of the world continue to employ their disastrously flawed Keynesian economic models which create welfare, warfare and ultimately massive inflation. Politicians love having all of the “free” money, hot off the printing press, to buy votes, line the pockets of their associates and bail out their friends. That is why these leftist notions of a nanny state taking care of us from cradle to grave, often embraced by Republicans and Democrats alike, is not going to solve the problems it was intended to solve. This is because everything has a cost, yes even the nanny state, corporate welfare and the like. As the price of the yellow metal rises the buying power of the savings of billions of individuals decreases; so they are in effect robbed in broad daylight by the Keynesian inflationary policies. Is it any wonder that the standard of living continues to decline all over the western world. One of these days, it may dawn upon people, en mass; that in general the government doesn’t solve problems, it only creates problems. So the only way to truly solve problems is by strictly limiting the role of government to that of a referee and letting the free market bring about the solutions we need. Had the free market been allowed to act upon zombie banks years ago, when the problems first arose; these banks would have never become “too big to fail.” Had the free markets been allowed to act, unhindered, in the health care field, we would have more choices and less people unable to get the help they need. It really saddens me to see my countrymen repeating this cycle over and over again, unaware and uncaring of the fact that it makes their lives much more difficult and constrained. I often wonder when it will become apparent to them that all of this nonsense isn’t working. Will it be when gold is at 3,000? 5,000? 10,000? I can’t say for sure when decisive action will be taken; but if history is any indicator, inevitably there will come a point at which the pull of the massively centralized state on people’s lives distorts the culture of these people to such an extent that they decide they’ve had enough of it. This would be the point where they realize that it costs so much more to live in a massive welfare state than the benefits that are derived from it and the productive individuals either demand real change, or they pull up anchor and head for some place which will suit their needs. During the boom years of globalization and credit expansion, a tremendous amount of over-capacity was created. Now that consumers are tapped out and the bills are coming due, we see economic phenomena such as: idle shipping vessels, idle dock cranes and shipyards running out of orders for new ships to build. These are the kinds of outcomes you see when people become driven by the irrational forces of the current international fiat money system. Supply and demand are not as effective when you have government and monetary authorities toying with foreign exchange rates and creating vast sums of fiat; this wreaks havoc on markets and causes the severe imbalances we have been seeing as of late. One of the most telling signs, of how crippled world economy has become lately, is a vast fleet of idle cargo ships off the coast of Singapore. With trade dropping off around the world, the price to charter these ships is now a tiny fraction of what it was in better times; many ships cost 1/10 of what they once did. Unless we replace our monetary system with sound hard-asset-based money, it is likely that we will continue to see these kinds of severe imbalances for many generations to come. The tropical waters that lap the jungle shores of southern Malaysia could not be described as a paradisical shimmering turquoise. They are more of a dark, soupy green. They also carry a suspicious smell. Not that this is of any concern to the lone Indian face that has just peeped anxiously down at me from the rusting deck of a towering container ship; he is more disturbed by the fact that I may be a pirate, which, right now, on top of everything else, is the last thing he needs. His appearance, in a peaked cap and uniform, seems rather odd; an officer without a crew. But there is something slightly odder about the vast distance between my jolly boat and his lofty position, which I can’t immediately put my finger on. Then I have it – his 750ft-long merchant vessel is standing absurdly high in the water. The low waves don’t even bother the lowest mark on its Plimsoll line. It’s the same with all the ships parked here, and there are a lot of them. Close to 500. An armada of freighters with no cargo, no crew, and without a destination between them. My ramshackle wooden fishing boat has floated perilously close to this giant sheet of steel. But the face is clearly more scared of me than I am of him. He shoos me away and scurries back into the vastness of his ship. His footsteps leave an echo behind them. Navigating a precarious course around the hull of this Panama-registered hulk, I reach its bow and notice something else extraordinary. It is tied side by side to a container ship of almost the same size. The mighty sister ship sits empty, high in the water again, with apparently only the sailor and a few lengths of rope for company. Nearby, as we meander in searing midday heat and dripping humidity between the hulls of the silent armada, a young European officer peers at us from the bridge of an oil tanker owned by the world’s biggest container shipping line, Maersk. We circle and ask to go on board, but are waved away by two Indian crewmen who appear to be the only other people on the ship. Here, on a sleepy stretch of shoreline at the far end of Asia, is surely the biggest and most secretive gathering of ships in maritime history. Their numbers are equivalent to the entire British and American navies combined; their tonnage is far greater. Container ships, bulk carriers, oil tankers – all should be steaming fully laden between China, Britain, Europe and the US, stocking camera shops, PC Worlds and Argos depots ahead of the retail pandemonium of 2009. But their water has been stolen. They are a powerful and tangible representation of the hurricanes that have been wrought by the global economic crisis; an iron curtain drawn along the coastline of the southern edge of Malaysia’s rural Johor state, 50 miles east of Singapore harbour. the beaten track that nobody ever really comes close, which is why these ships are here. The world’s ship owners and government economists would prefer you not to see this symbol of the depths of the plague still crippling the world’s economies. the ever-present threats of piracy and collisions in the congested waters as the hulls gather rust and seaweed at what should be their busiest time of year. Local fisherman Ah Wat, 42, who for more than 20 years has made a living fishing for prawns from his home in Sungai Rengit, says: ‘Before, there was nothing out there – just sea. Then the big ships just suddenly came one day, and every day there are more of them. The size of the idle fleet becomes more palpable when the ships’ lights are switched on after sunset. From the small fishing villages that dot the coastline, a seemingly endless blaze of light stretches from one end of the horizon to another. Standing in the darkness among the palm trees and bamboo huts, as calls to prayer ring out from mosques further inland, is a surreal and strangely disorientating experience. It makes you feel as if you are adrift on a dark sea, staring at a city of light. 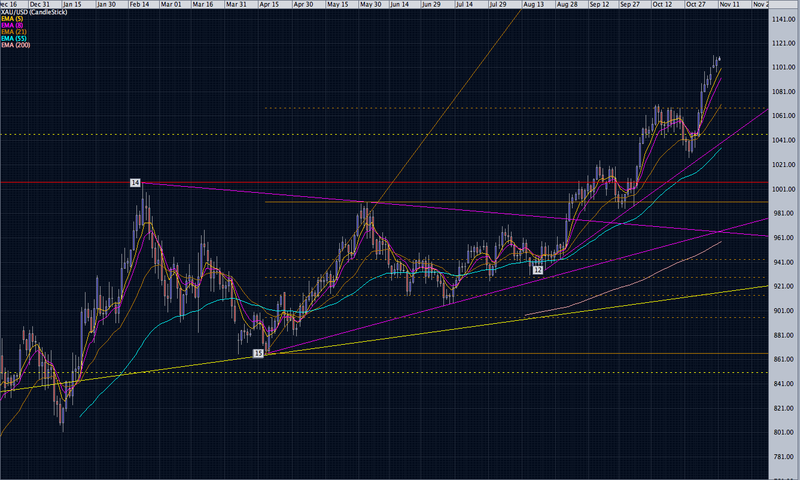 It looks the yellow metal is preparing for another increase. Tonight it is moving above the key $1000 level to $1008 USD. Based upon the inverted Head & Shoulders formation on the medium-term chart, the target on this move is approximately $1379. If this indeed occurs, it means a tremendous selloff in the US Dollar; because gold almost always acts in inverse of the US dollar. The extent to which the dollar falls relative to the other currencies depends on how much gold increases relative to those currencies. As has been predicted for years, we are moving from a confidence based economy into a hard asset based economy. Over then coming weeks, I expect we will see some shocking dollar corrections in the currency markets; which will begin to wreak havoc over the daily lives of billions of people. We are likely to see civil unrest, rapid increases in prices for everyday items and shortages. 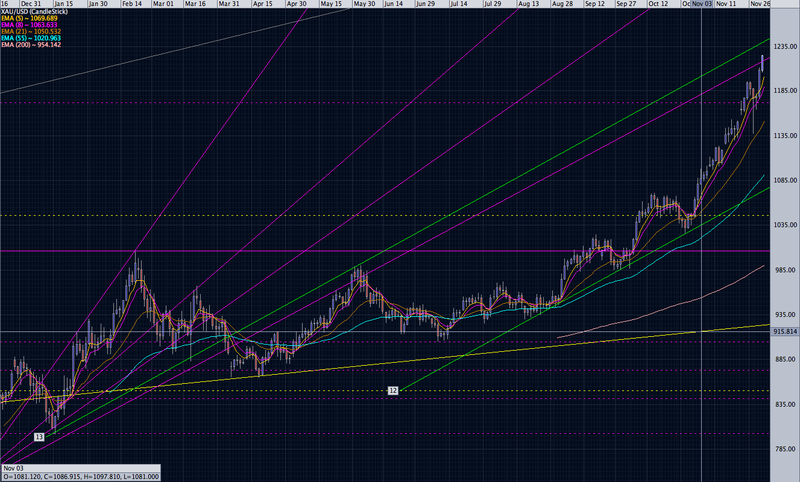 Elliott Wave Formation in Gold as it Reacts off of its all-time high at $1037. 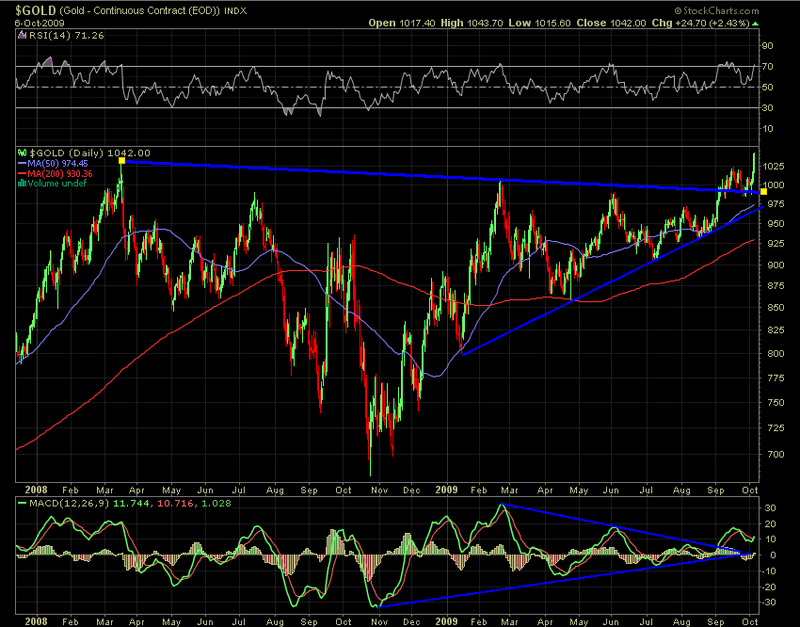 Gold broke out of the recent consolidation wedge, confirming some recent bullish activity. You rarely hear about the true nature of the dilemmas our financial system faces. Only recently, as the real economy begins to implode, do the financial media talking heads even discuss such matters. Judging by the lack of concern amongst most of the people out there; they probably do not realize just what kinds of sums we are dealing with.